Here is a simple recipe for gingerbread biscuits (cookies). 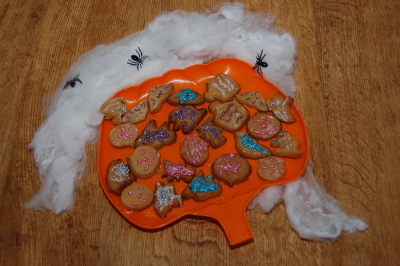 These can be made for any occassion using appropriate cutters, the example used here is for Halloween. I made these with our 3 year old daughter who enjoyed both making and eating them 🙂 Great fun for kids and adults. We used Barbie Fairytopia writing icing which had a glitter effect. You could use any writing icing or make your own from icing sugar and water. Adult assistance is required particularly when using the oven. An oven is hot! hot! hot! For more information on things to do with babies and children see the watkissonline kids pages. This entry was posted on Thursday, October 30th, 2008 and is filed under Children, Cooking, General. You can follow any responses to this entry through the RSS 2.0 feed. Both comments and pings are currently closed.